We took an early look at Humin, an impressive contacts app for the iPhone, back in January this year. Finally, it’s launching onto the App Store in the US today and it’s even better than when we first tried it. Humin works best when it’s placed in your dock in place of the default Phone app. It organizes your contacts in a smart way, replacing the normal alphabetized list with factors like your location and the day and time. 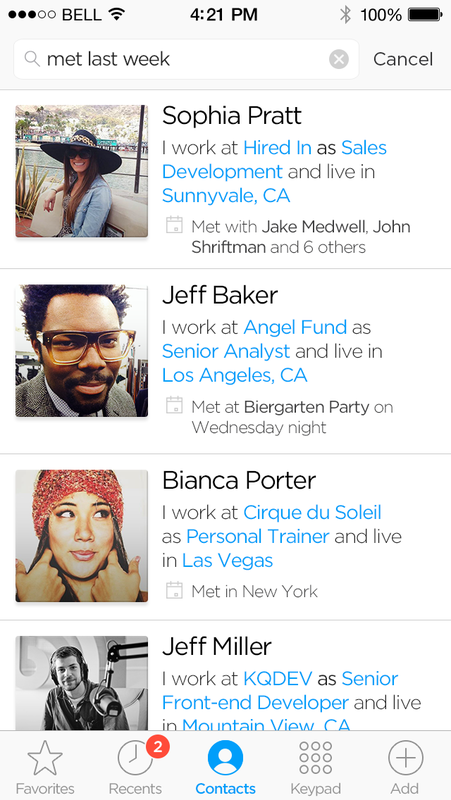 Over time, the app learns which people are most relevant in a particular context and displays them first. The search facility is just as impressive. It’s based on a ‘connection graph’ built up of data from Gmail, Facebook, LinkedIn and other sources. Our brains don’t organize the people we know in order of their surnames, but by arbitrary connections like ‘We met at a party in Paris’, ‘She works at IBM’, or ‘He lives in New York City’. 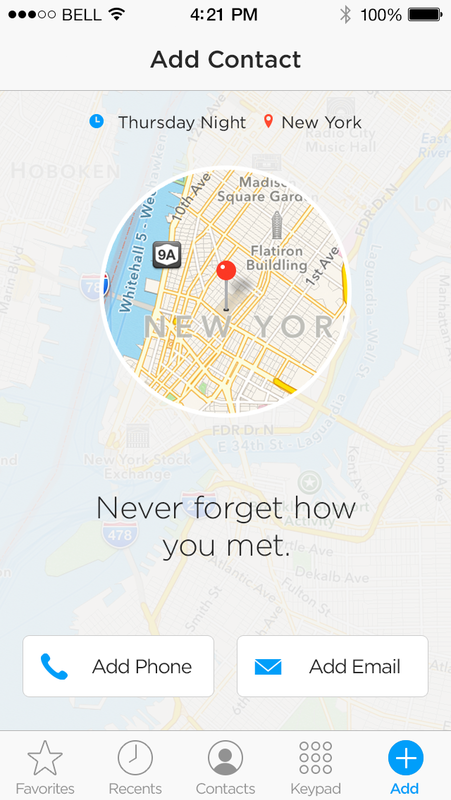 Humin gets its name from a ‘human’ approach to search. When I enter ‘Works at The Next Web’, I get a list of all my colleagues. If I search for ‘lives in San Francisco’, I get a list of everyone in my contacts list from that city. In the months since we first checked Humin out, the San Francisco-based team has been busy refining the product and now many people will be able to discard their default Phone app completely. The startup has arrangements with all major US carriers so that your missed calls and voicemail can be routed to Humin. The app works well overall, aside from the odd minor bug here and there (the app insists that the company ‘The Next Web’ is called ‘Next Web’, for example, and former employees can show up in a company search, even if their data shows they’ve moved on). Beyond these niggles that can be ironed out by the developers over time, the quality of the experience is only as good as the quality of the contacts data on your smartphone. To that end, there’s a feature that allows users to request updated contact details from people they know. During the app’s beta period, it would mass-mail all contacts to request updated data, without it really being clear to the user that this is what would happen. Humin briefly developed a reputation as a spammy app among some early adopters, although CEO Ankur Jain says that the company learned from this experience. 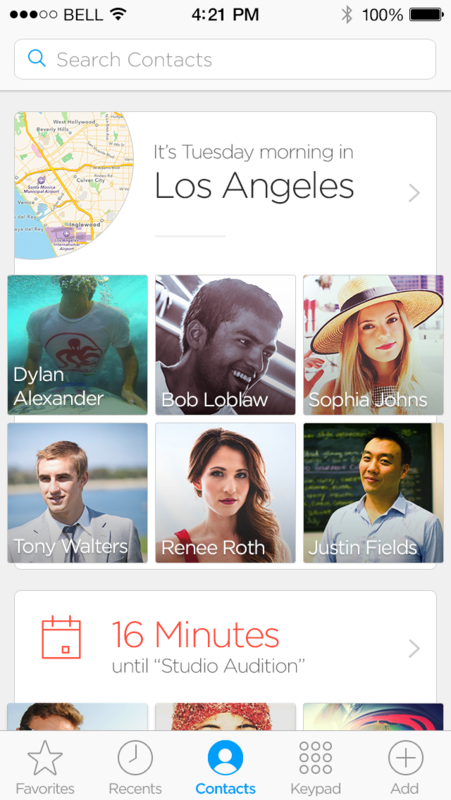 Now, requests are more granular, with users being able to select exactly who they want the app to contact. I can’t help thinking that FullContact’s API would be worth the company exploring for a smoother experience, though. Jain sees Humin as a company built around “tech that thinks about people the way you do.” He describes the core technology underpinning the app as “like PageRank for contacts.” How this could be used beyond smartphones is intriguing. Jain mentions wearable devices and cars as markets the company is exploring, although I’m sure the enterprise market could find uses related to CRM too. Humin is currently available in the US only but will open up to new markets over time, with a UK launch coming soon. Update: After publishing this article, a couple of users from the beta program have told us that Humin is still sending contact update requests out in their name despite them having deleted the app. We contacted the company for clarification about the issue. Humin reiterated that the verification flow has been changed to stop bulk requests for contact details, adding that an option to cancel verification has been added in-app, and any users affected by such an issue can contact the company to have all requests switched off. Read next: Report: People in emerging markets prefer big smartphones. Here's why.